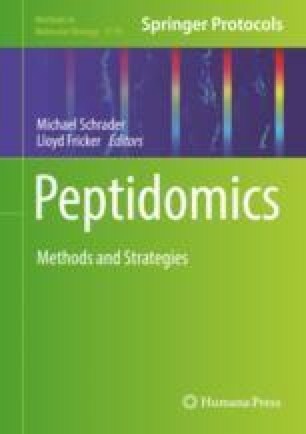 Neuropeptides and peptide hormones are signaling molecules produced via complex post-translational modifications of precursor proteins known as prohormones. Neuropeptides activate specific receptors and are associated with the regulation of physiological systems and behaviors. The identification of prohormones—and the neuropeptides created by these prohormones—from genomic assemblies has become essential to support the annotation and use of the rapidly growing number of sequenced genomes. Here we describe a methodology for identifying the prohormone complement from genomic assemblies that employs widely available public toolsets and databases. The uncovered prohormone sequences can then be screened for putative neuropeptides to enable accurate proteomic discovery and validation. This work was supported by the National Institutes of Health, Award No. P30 DA018310 from the National Institute on Drug Abuse (NIDA), the US Department of Agriculture (USDA) National Institute of Food and Agriculture (NIFA) project No. ILLU-538-909, and the National Science Foundation, Award No. CHE-16-06791. The content is solely the responsibility of the authors and does not necessarily represent the official views of the funding agencies.